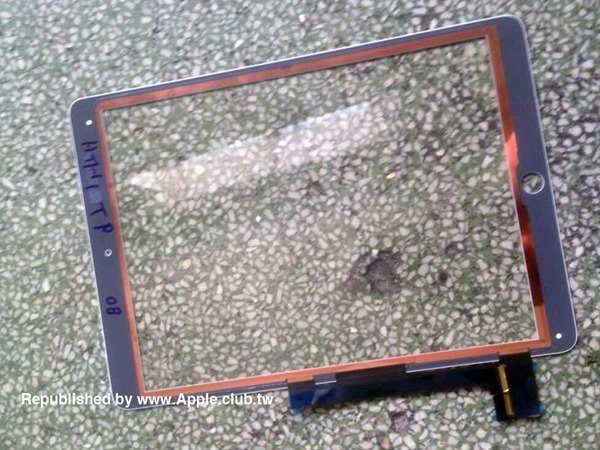 As Apple’s October 16th iPad / Mac event draws near, some photos of the iPad Air 2’s hardware components have leaked onto the Internet. This includes the tablet’s motherboard, Home button flex cable, front panel, and the volume control flex cable. We covered news before that showed photos of a rumored iPad Air 2, and there seemed to be that hint of a Touch ID Home button. However, we could not have been entirely sure just by the looks of it. 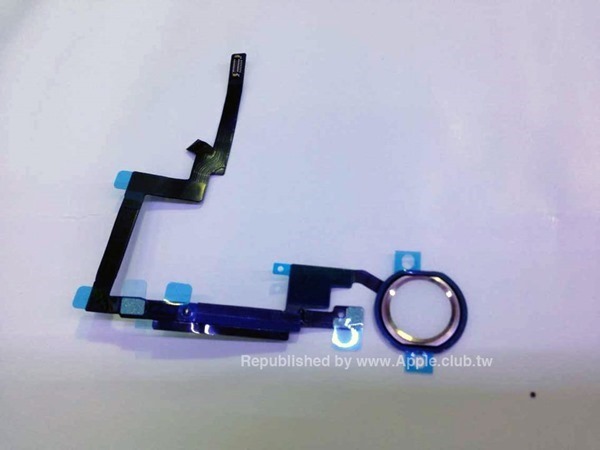 This new leaked photo of the Home button flex cable finally reveals the stainless steel ring with the room to house that Touch ID sensor. We can now confirm that at least, the iPad Air 2 – as we refer to it – will be sporting the Touch ID feature. Apple could be leaning towards making this feature available for all its up coming tablets. Looking at the motherboard, we see what could most definitely be the Apple A8X processor, as confirmed by a MacRumors forum user. Given that the iPad Air 2 could be sporting a Retina HD display, it will be interesting to see what clock speed the processor is set at to push all those pixels. RAM capacity is still not definitive, even with the leaked photo and we can cross our fingers for a good 2 good GBs of it. 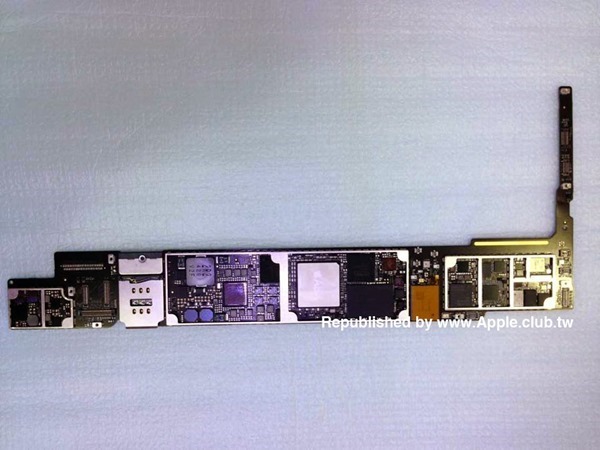 Interestingly, unlike the iPad Air, its successor seems to have moved the SIM slot directly onto the motherboard. 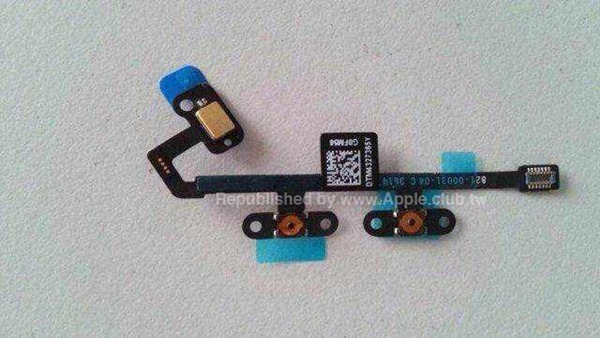 The iPad Air housed the SIM slot as a separate component, independent of the motherboard. 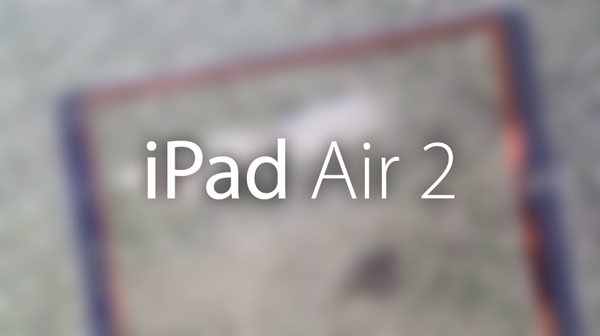 Given that Apple is determined to make this year’s iPad Air slimmer than before, there is reason to believe that Apple might be skipping the Mute / Screen Rotation button on the new iPad Air. The volume control flex cable as shown, houses the up and down volume buttons, but no third button. While not much has changed with the front panel – given the Home button cutout and the front camera placement – there have already been speculations about the tablet featuring an integrated display. This should make the tablet pretty slim by many standards, but if you ask me; skipping the Mute / Screen Rotation switch could be a controversial move. I would rather have a switch that instantly lets me mute or kill the screen rotation on my device. Would you want to compromise on that instant function for a crazy slim iPad Air 2, which luckily we wont be able to pocket in our trousers? See what I did there. Let us know what you think! wow, i am so surprised! Apple is really doing some revolutionary things… every update is so unpredictable, it just makes me want to jump out of my seat in joy!!!!!! What’s this obsession with thinner? What about longer lasting battery life? Or God forbid something truly innovative?